Wondering if you could take a quick glance at my planned garden layout. Any disastrous combinations? Any glaring problems? First time having a garden plot and not just growing in containers. I tried to put the tallest plants on the north side, shortest on the south side. Sorry! No, the icons are not individual plants. I was originally planning for it to be that way, but either the whole picture would be HUGE or each icon would be teeny-weeny and you couldn't see it. So I improvised with an "impressionistic" (?) schematic. I was more concerned about if I had planted 2 plants next to each other that will be disastrous. For the corn, I am planning to space 6" apart in 3 or 4 rows, each 2 feet apart. Should be a total of 70-80 plants, wow! For the tomatoes, I am planning 12 total plants (2x6). For the peppers, I am planning 3 plants of each kind, planted in one long row. For the potatoes, I am probably planning 3 plants of each kind, planted in one long row. For the basil, I am planning one long row, however many plants I can fit in! Then the south end of the garden will be divided evenly between onions and carrots. That weird triangular shape to the east side will hold maybe 4 pea plants. looks good....but you can grow a helluva lot of carrots and onions in 180 square feet. You have a huge plot...why not try a few different things? Cukes, zuchs, squash, peppers, beans? JayPoc wrote: looks good....but you can grow a helluva lot of carrots and onions in 180 square feet. You have a huge plot...why not try a few different things? Cukes, zuchs, squash, peppers, beans? Hmm, maybe. So far, the corn, tomatoes, peas, red potatoes, and bell peppers are all new plants to us. This is our first year in this home, so we may be in over our heads. My partner really wants to try cukes and beans. If we think we have extra room, we may do that! Good point. Perhaps we will add more of these plants then. How tall do they get? Maybe we could squeeze a row in in front of the tomatoes, and then put a squash in on that triangular patch on the side? Nice size for a garden. You are in for an adventure. Enjoy! In your area, do the temperatures remain cool enough for peas to grow in the summer? In my garden, peas shrivel and die in late spring early summer, either by the time sweet potatoes can be planted or soon after. So I can grow peas in a spot that I intend to plant sweet potatoes later on. Are the peas short kind (2-3ft) or tall kind (5-7 ft)? 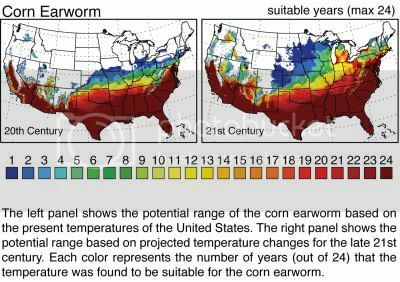 Usually, it's not a good idea to grow tomatoes next to corn because "corn ear worm" and "tomato fruit worm" are actually exactly the same pest and will migrate from one to the other. Does your area get this pest? Keep in mind -- onions (sets/bulbs) and peas are likely to be planted earliest with carrot seeds a week or so behind, then potatoes and onions (plants). Corn a couple of weeks after that, then tomatoes in another week or two. Basil and peppers a week or two after that, and sweet potatoes last of all when the ground is thoroughly warmed up. Carrots and onions won't take up much space but will want plenty of light -- good for lining the edge of pathways. Basil will be somewhat taller (knee high) -- about one square foot per plant -- but don't mind a bit of shade (I plant them in front and between tomatoes). Peppers need less sun than tomatoes. Potatoes will be dug up (thoroughly) in mid to late summer, but sweet potatoes won't be dug until just before frost. Last edited by applestar on Mon Mar 25, 2013 12:11 pm, edited 1 time in total. Not sure what your plans are for Basil, but a row of it will give you tons of the herb. My basil plants generally get to be about 3+ ft. tall and fill out to almost 3 ft. across in a season. I use a lot of basil and only have 2 plants available, one in a pot on my back porch for easy access and one in the ground when I need more volume of the herb. You must be planning on making a lot of pesto. peppers, tomatoes and potatoes are all in the nightshade family and subject to many of the same pests / diseases - you might want to not plant them all together in a big block. like lettuce, or Asian greens. That way I don't have roots competing for the same space. The greens are shallow rooted and will be harvested in 40-50 days anyway. I can get 2 crops in the same space that way. I plant corn in blocks instead of rows for better pollination. How many plants do you think you are going to put in? I know you said that the plan is conceptual. 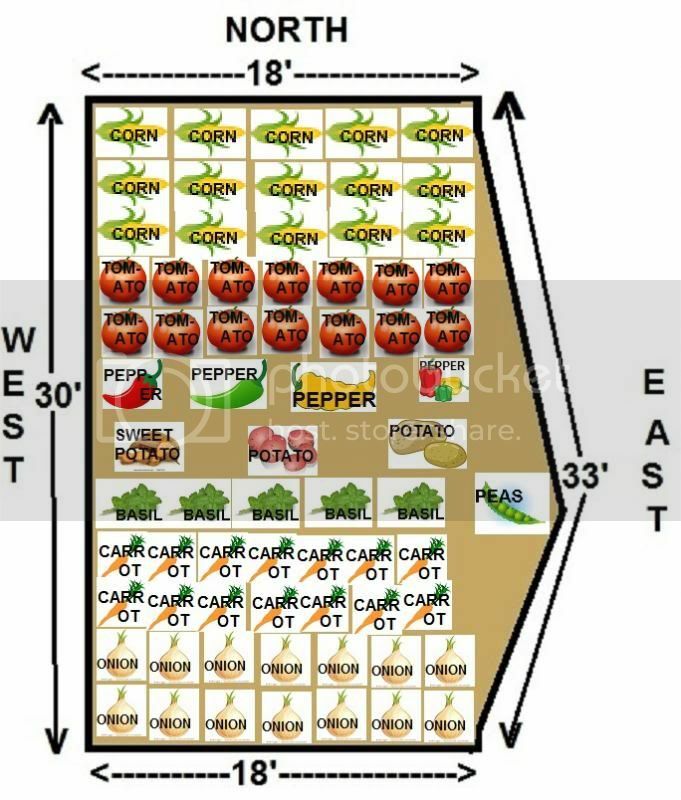 It would help if you anotated how much of each you are going to plant and the approximate area they take up it would help. it is good that you have the taller plants in the back. I guess the tomatoes are on a trellis. Sweet potatoes like to sprawl and they will overtake the basil if they are too close. Would you consider changing places with the peas instead. You could also add some cucumbers, beans and share the trellis with the peas. Zucchini (2 plants), and a few herbs. Some of the plants can go other places in the garden. Herbs do great in containers. It also helps to plant some nectar and plants that attract beneficial insects to the garden. Marigolds and nasturtiums are practical and "pretty" too. You have a big garden compared to mine so you really have a lot of choices. It is easy to plant more than you can eat so it might be good to space your plantings to prolong your harvest as long as you can. You could plant lettuce and greens every 2-3 weeks (I plant only 10 heads at a tiime since that is all that I can use). I also grow long lived plants that I can get repeat harvests from like kale, swiss chard, hot peppers, herbs, eggplant, and ginger. Some of them I plant in containers since they do sprawl out so I plant smaller things, except corn, in the garden that can be planted closer together. Sweet potatoes, chayote, some squashes and standard watermelons take too much space, so I plant icebox watermelons with 6 foot vines, chayote and squashes on fences and overhead trellis, Tomatoes in containers, and sweet potatoes in a large half barrel to contain them. I have herbs in containers spread in different areas of my yard, but close to the kitchen for harvest. I like butternut squash, the Waltham butternut is the best, but butterbush has much shorter vines (6-8 ft). applestar wrote: In your area, do the temperatures remain cool enough for peas to grow in the summer? My temps usually remain pretty cool (60's to 70's until late July. applestar wrote: Are the peas short kind (2-3ft) or tall kind (5-7 ft)? Have no idea, Burpee's seed packet did not specify a height. They are sugar snap peas, if that helps! My partner picked them out. applestar wrote: Usually, it's not a good idea to grow tomatoes next to corn because "corn ear worm" and "tomato fruit worm" are actually exactly the same pest and will migrate from one to the other. Does your area get this pest? I guess I assumed corn ear worm was everywhere. I know that none of my friends/neighbors/family that grow tomatoes have never mentioned it. Based on the left side of this map, I am in the clear. But not on the right side of this map. I don't know which one to use as the study is 5 years old. How far away should I plant the corn and tomato? I am worried about the tomato shading the rest of the plants if I move them any further south in the garden. gumbo2176 wrote: Not sure what your plans are for Basil, but a row of it will give you tons of the herb.... You must be planning on making a lot of pesto. BINGO! Last year I was container gardening (because I was in an apartment) and I believe I grew 15+ basil plants. like lettuce, or Asian greens. I see your point about not sharing the same soil. I have a lot of space, so I think they will be fine. imafan26 wrote: I plant corn in blocks instead of rows for better pollination. How many plants do you think you are going to put in? We were going to plant the corn in 4x4 blocks, but when we realized we had so much room, we decided to plant the corn still 4 wide, but 10 long (then doubled bc we have 2 varieties of corn). We may change this again, maybe put some squash or something on the far northwest corner. imafan26 wrote: it is good that you have the taller plants in the back. I guess the tomatoes are on a trellis. Yes, this is the plan, but my partner and I are bickering a bit about this. She wants me to use tomato cages (cheap, and everyone we know uses them with literally zero problems). After reading the stickies in the tomato forum, I wanted to try the concrete wire that everyone was using, but Home Depot had no idea what I was talking about and said they had nothing like it. So we will likely start with tomato cages this year. imafan26 wrote: Sweet potatoes like to sprawl and they will overtake the basil if they are too close. Would you consider changing places with the peas instead. Hmm, could do that. I was planning on working the sweet potato vines along the garden fence. imafan26 wrote: You could also add some cucumbers, beans and share the trellis with the peas. imafan26 wrote: Some of the plants can go other places in the garden. Herbs do great in containers. Yes, I also have planned for oregano, catnip, chives, dill, lemonbalm, and lettuce in containers. Also, my houseplants (Kalanchoe, some succulents, Gerber daisies, jade, and a few others) will finally come outside to get some sun. imafan26 wrote: You have a big garden compared to mine so you really have a lot of choices. It is easy to plant more than you can eat so it might be good to space your plantings to prolong your harvest as long as you can. Yes, we have one early and one late kind of corn, 3 early and 3 late lettuce, etc. We are also planning on having a lot of veggies to share with people we love. CRW -- my local home depot sells them in flattened panels near the sand in gardening dept., tucked between those giant racks. Not all employees are aware of it. I haven't discovered where they sell rolls or if they do. Right now, the outside gardening section is closed so I don't know where they have them, but I did see that they are sellin all purpose sand all the way past the lumber section on opposite end of the building. I had to go all the way there for some hardware cloth too. They sell cinder blocks WAY over there even when gardening section is open. Would it kill them to keep a pallet of the stuff with concrete pavers? Regarding the tomatoes - If you are planting indeterminate varieties plan on a lot of room per plant - like 9 sq ft. If you are planting indeterminate and growing them vertically then you can plant 1 per square ft. I grow my tomatoes at the back of my boxes. G made upside down U shaped frames from re-bar that are pushed down in the corners of my 4' wide boxes. I tie twine and grow my indeterminates up the twine. I could put 4 at the back of each box but I only plant 2 just to make it easier too get to the plants to pinch suckers and harvest. The concrete wire is a good idea for both your tomatoes and cucumbers. You do need to attach the sides to something like rebar pushed in to the bed. Tie the wire to the rebar with zip ties.